The markets go up and the markets go down, but it’s your choice how you view their journey. One option is to mark the height of their fluctuation and measure your success from there. However, as this kitten knows, this is a strategy that is dooming you to depression. Although the markets do have a gradual increase in value, their returns are not a straight line. The highs can be higher and the lows lower than the average growth which you gain from your long-term investments. 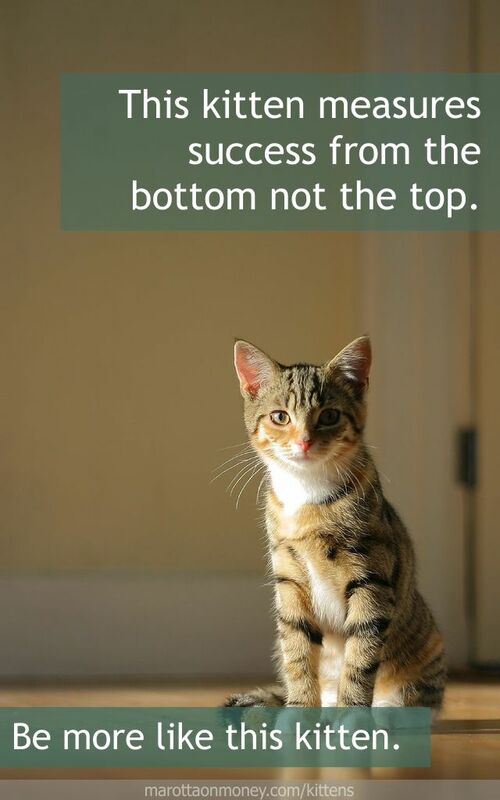 Instead, this kitten takes the other option and measures her success from the bottom, meaning from the amount of money she’s put into the account. So long as her portfolio’s value is still higher than what she’s put in, she knows that her investment strategy has been successful at earning her money. She draws the straight line through the highs and lows to see her long-term, successful growth. Love it! Hope to see more sage advice from Investment Kitteh! Lucky for you, we have a whole host of financially savvy kittens and are introducing a new one each Wednesday. Be sure to check out the next kitten here. Also, subscribe to the blog if you don’t want to miss a single cute teacher.